No. 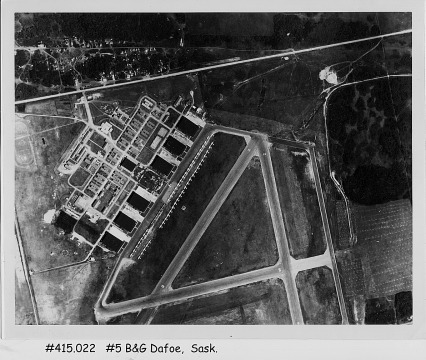 5 Bombing and Gunnery School was one of 21 Royal Canadian Air Force stations established in Saskatchewan. No. 5 was located approximately 20 km. west of the town of Dafoe, an uncharact-eristically long distance, in rural Canada, between a BCATP station and the nearest town. It was one of two B&G schools in Saskatchewan (11 in Canada), the other being No. 2 B&GS in Mossbank. 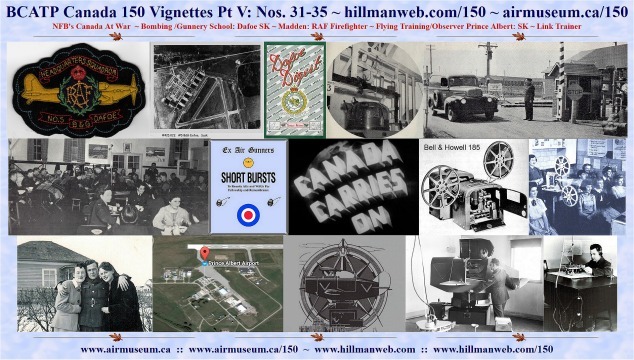 Opening on June 23 1941, it remained open for 1,335 days until the RCAF closed it on February 17 1945. The initial personnel roster included 45 officers, 486 airmen and 69 trainees. The number of trainees grew to 366 in the school at any given time. Having completed Wireless Training prior to coming to No. 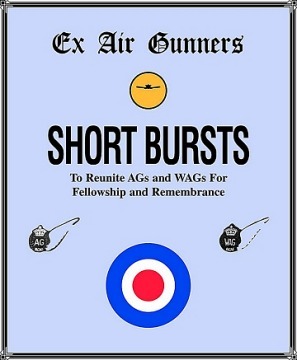 5 BGS, air gunners graduated as Wireless/Air Gunners or WAGs. Flying exercises were conducted day and night. Training included bombing runs over the nearby Quill Lakes. The school’s motto was "We Aim to Teach and We Teach to Aim." Aircraft used at No. 5 BGS included the Westland Lysander, Bristol Bolingbroke, Avro Anson and Fairey Battle. No. 5 BGS reported 123 accidents with 41 fatalities to the RCAF. 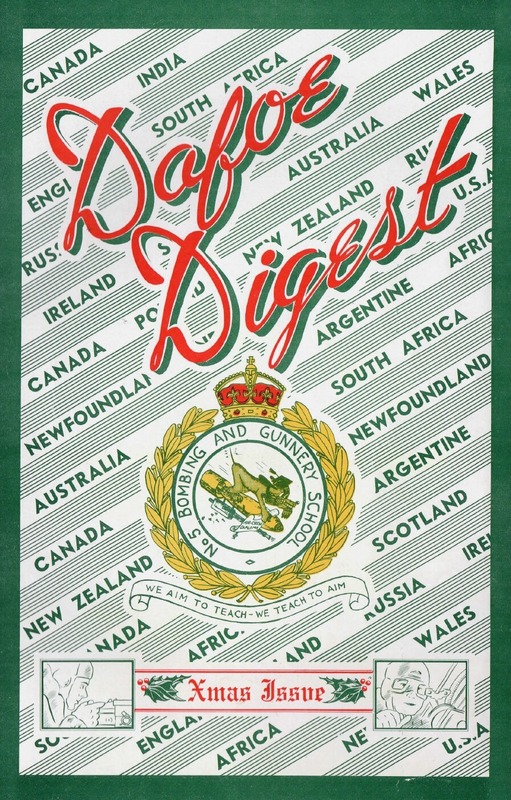 Over the course of the RCAF's stay at Dafoe, the school had three concurrent station magazines - "Dafoe Doings," "Dafoe Days" and "Dafoe Digest." No. 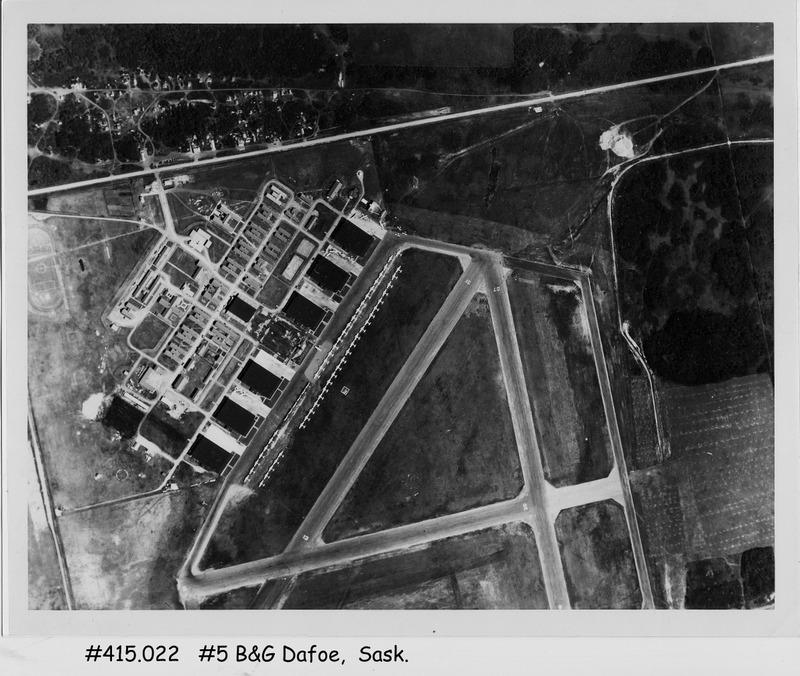 5 BGS was built with six hangars and a number of supporting buildings for ground training, police, post office, armament, messes, barracks and parachute training and so on. Streets were named after Canada’s Dionne Quintuplets - Yvonne, Annette, Emilie, Marie and Cecile. Of all the British Commonwealth Air Training Plan stations across Canada, only two, Dafoe and No. 2 BGS in Mossbank Saskatchewan had indoor swimming pools with swimming a secondary purpose to the primary which was to provide water in case of fire emergencies at the station. As the school itself did not offer married quarters and the Village of Dafoe was a very small village with limited rental accommodation available, many couples chose to live in a 'Boomtown' adjacent to the station. By 1942, the number of 'homes' went from zero to 142 in Boomtown, some owned by airmen, and the others owned by locals who rented to air force families. Most of the homes were shacks and converted grain bins with Spartan amenities – outhouses, no water or electricity etc. Enterprising locals set up a few shops. Rent became so excessive that The War Time Prices and Trade Board was brought in to arbitrate appropriate rent for the buildings. The board decreased rents by one third to one half. When closed, a number of the support buildings were moved to various communities nearby the school. One of the buildings became the LeRoy Hospital which is now the Evergreen Country Home and another was the LeRoy Legion Hall which is now the School of Dance. 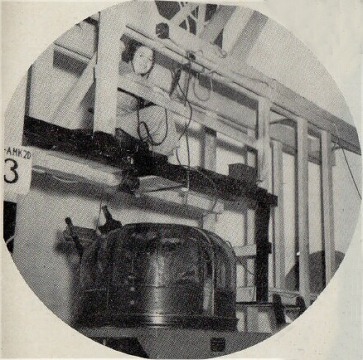 The Canadian Government maintained a weather station at Dafoe for a time after the school left. All that remains today is one hangar used by a local farmer for machinery storage. I feel sorry for kids in school today who will never have the chance to learn new things about the outside world like we did in the 1940s and for four decades after. If you attended school before 1985, you will remember those wonderful classes where you sat down with your classmates in a darkened room to watch 10 or 20 year old 16 mm short films from the National Film Board. If you were lucky, the films would have a little wear on them with questionable splices which caused the image to jump and a wonderfully `warbly’ sound track. The NFB is a worthy Canada 150 vignette subject for its role in explaining to military personnel and civilians in Canada, many aspects of World War II at the time it was happening. Today’s vignette doesn’t deal directly with the `Plan,’ but with Canada at the war as seen through the camera lenses of the National Film Board. The National Film Board is a hallowed cultural icon which provided a great and sustained service to many Canadians by bringing the stories of unknown friends and families to the screen from baseball fields, fishing boats, the ballet, the battle front and hundreds of other locations. It offered informative films to which people could relate by finding out what other ordinary people were doing. The National Film Board was the provider of a multitude of real life stories to those willing to spend the time watching. In the 1950s and 60s, television was constrained to melodrama and sports popular enough to generate huge sales for advertisers. Viewing choices were restricted to either `on’ or `off’ in one station towns or 'this one' or 'that' in two station towns - and the internet was decades away from creation. The NFB gave us some of our greatest educational and entertainment experiences through hundreds of short documentaries about lumberjacks floating logs down the river, John Vernon as head of a Ukrainian immigrant family of outsiders in a bigoted rural town, small towns dealing with the need for a fire department and farm families discussing various ways to increase crop yields on their small Saskatchewan farms. 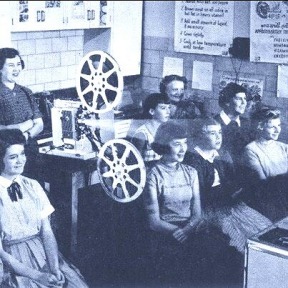 The NFB documentary was a staple in many school classes for a weekly visual shot of the outside world at that time. The creation of the NFB came in 1939 when this Canadian Government organization produced the first of 13,000 documentaries -- of which, 5,000 have won awards for quality. One NFB film, Churchill’s Island was the first to win the Academy Award for short film in 1942, in the newly created Documentary category . In addition to classrooms, NFB short stories were standard fare in Canadian movie theatres between 1939 and the mid-1950s where the price of admission would get you two features and 45 minutes of short films and cartoons. For those living in remote areas without movie theatres, the NFB sent out mobile projectionists equipped with generators, projectors and of course, the films. The National Film Board was created in part to provide war propaganda for the Canadian Government. It stepped up and did it’s patriotic duty to explain to Canada the truth about topics related to the World War II - military operations, enemy aggression in far-away theatres of war, domestic war production, military training and life on the home front. 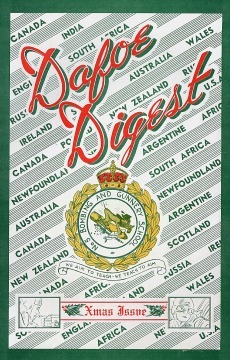 The home front was a favourite topic for many as the films featured subjects like the consequences of rationing and Canadians shrugging off the stress of war through entertainment, hobbies and sports. No subject was left out of the wartime short films – blood thirsty tyrants, the fight for safe passage over the Atlantic and in the skies of Great Britain, women assembling aircraft and tanks, house wives dealing with the provision of nutritious meals in a world of shortages, and kids at play and in school despite the country’s struggle for victory. The NFB’s war program was delivered through newsreels in movie theatres or for anyone with access to a film projector. 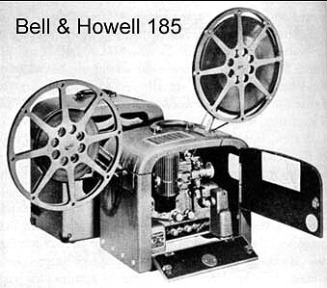 Newsreels were the precursor to our modern TV network 30 minute newscasts. Short 'news' reports, with narration in the background, were bundled together for audiences on film `reels,’ much like television news programs today but with videotape instead of film reels. The other venue for war stories and propaganda was serialized documentaries like "Canada Carries On" and "The World In Action" whereby movie goers received regularly scheduled installments on the progress of the war. 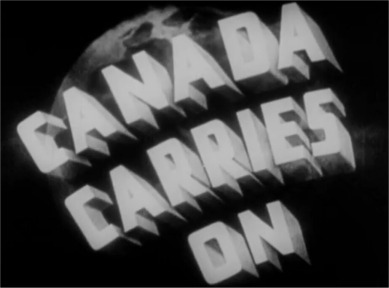 The Canadian Broadcasting Corporation (CBC) and Canadian army delivered similar newsreel products to the public. In November 1941 the NFB's mandate was expanded to include still photography services to the country. Between 1941 and 1985, this arm of the NFB commissioned freelance photographers to make tens-of-thousands of photographs on Canadian life, of which many from World War II are significant archival materials in our museum. The photographs in our previous vignette on the Quebec Conference are all from the NFB. We can now take a look at the NFB films of World War II on its 21st century web pages. The National Film Board is still alive and kicking with a little modern repurposing. The following link will take you to a number of viewable, NFB produced, WWII documentary collections including 'Canadian Military Forces,' 'Canadian War Effort,' 'Veterans,' 'War Industries,' 'World War II' and `World War II Military Operations.' Some of the documentaries are available on DVD. They are fascinating works of art about Canadians proud to be just that… proud Canadians. If you watch one, you’ll surely watch another. 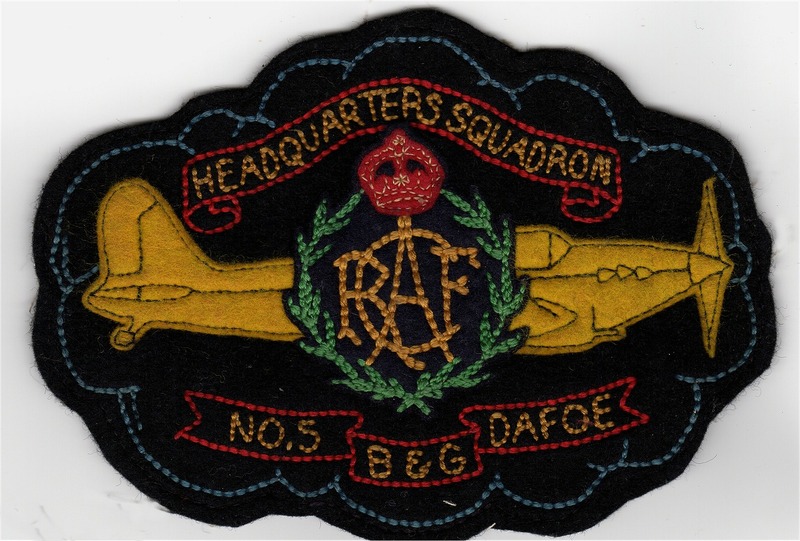 This wartime memory was received by the Commonwealth Air Training Plan Museum in December 2000. I should very much like to have a spot in your collection of stories of servicemen who fought for freedom in World War II. My involvement brought me to Canada under the BCATP (British Commonwealth Air Training Plan). "It's a long way from Tipperary", Ireland, where I was born at Fethered. My parents ran a small grocery store. I had one sister and three brothers. Because of the poor economy and the hope for more opportunities for the children we moved to England. Shortly afterward the war (World War II) broke out. I joined the RAF (Royal Air Force). I was just twenty years old. England, reeling and unprepared for the enormous task of halting such aggression, mobilized while defending the island. Canada and all the other Commonwealth countries rallied to the cause. Canada offered to take and train service men and especially the RAF under our 'open skies' under the BCATP. I found myself en route to Canada aboard the Aquitaine. A long train trip from Halifax brought me to Penhold in Alberta. It seemed unreal that Canada could be such a huge country--and we were so very far from home! The training was hard and we were not used to such severe winter weather. The barracks that housed us were very large and cold but we enjoyed the friendship of Canadians, had plenty of food and the recreation facilities were great. I was boxing champ of our unit until I married and my new bride vetoed this 'sport?'. She had a ringside seat at my first show and, unfortunately, I took a bad punch in the nose! Am I getting ahead of myself and my story? A wife, you say. Yes, I had to have special permission from the RAF to marry. It was a custom and a kindness from Canadian families to invite those far from home to spend their 'leaves' with them for holidays. At Xmas I was one of those lucky ones invited to Edmonton for supper and a visit to the city. Here I met Marian Elmquist, a very lovely Canadian girl from Hardisty (Alberta), who was employed at Woodwards. I knew my destiny, God willing, would be in Canada and more particularly in Hardisty. So, we were married. Soon I had to return to England and the hell the British people were having to endure. Britain was being attacked constantly. I was with a Fire Brigade stationed at air bases. It was a grim task to stand by when planes returning from raids over Europe came in, sometimes forced to crash land badly damaged with wounded and dead aboard. If they could not dump fuel or ammunition, this added to the danger of our job. Sometimes, we had to fight fire and rescue the crews. We did have asbestos suits which we wore for hours, always ready. Some memories of those years will haunt me forever as we were not always successful. It would be four long years before I was to set foot again in Hardisty where my wife and I began our life together. Albert Elmquist, Marian's father, sponsored my return. While I was gone, Marian had continued working and had bought a house for us. This was no easy task as my pay in the RAF was much less than that of Canadian boys which made her spousal allowance much less, too. No words can express how it felt to be stepping from the train in the middle of the night to be greeted by my new family. I was back in a free and friendly country where the skies are always blue. It is true that the Canadian economy was suffering a post-war slump so I worked at a few different jobs while getting my feet on the ground. I first clerked at a local grocery store. I had had some experience at home. Then, as my father-in-law was a railroader of long standing, I went to work as a brakeman. He had served in France in WWI with the Canadian Railway Troops providing supplies to the front line and bringing back the wounded. On his return to Canada he had continued to work for the CPR (Canadian Pacific Railroad) when an opening came up. The railway work itself soon went into a decline. Coal was replaced by oil as fuel for the engines and crews were let go. Fortunately, at just this time Hardisty was chosen as the site for an Inter-Provincial Pipeline Company pumping station and I was able to start work there as a yard man. Over the years I advanced to utility man and then to station operator. In 1982 I retired, after 28 years, to our very nice home in Hardisty. A son, Patrick, born in 1947 became a lawyer and a daughter, Maureen , born in 1952, became a RN (registered nurse). We have six grandchildren and three great-grandchildren. This has all happened to me because of the war: an Irish lad sent to a new land to train for war, returning after the war to put roots down and raise a family in a small town in Alberta. I am a proud Canadian now showing my age a bit but still enjoying the life and times in Hardisty. Please welcome me in your Museum History. 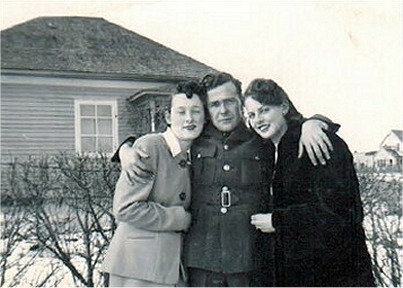 Patrick Madden with wife Marian on left and sister-in-law on the right. Partrick passed away on November 20, 2007 at the age of 90 years. His wife, Marian, passed away on June 16 2010 at the age of 86. We certainly appreciate his interesting submission to the museum. 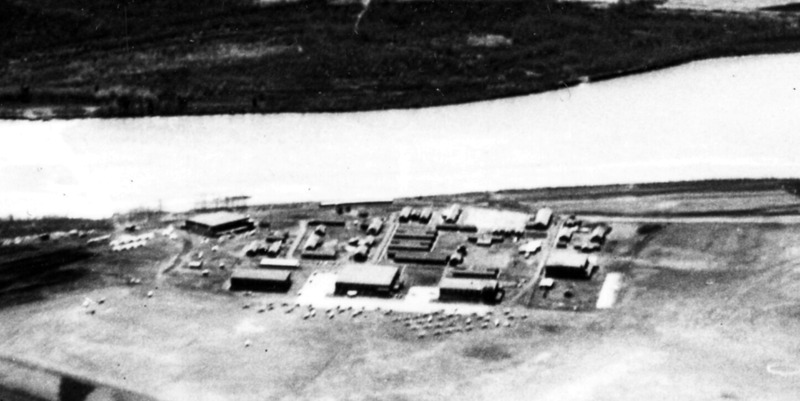 Prince Albert Saskatchewan was the home to two BCATP schools which were concurrently open. No. 6 Elementary Flying Training School was open between July 22 1940 and November 15 1944 for 1577 days while No. 6 Air Observer School was open between March 17 1941 and September 11 1942 for 543 days. Both were run by civilian contractors - the North Saskatchewan Training School (Saskatchewan Flying Club) and the Prince Albert Observers School. The Royal Canadian Air Force provided instructional staff to the two schools, Of the 2467 pilots trained at No. 6 EFTS, 1981 were RCAF and 475 were RAF airmen with 11 airmen from other countries. A total of 615 airmen trained as Air Observers at No. 6 AOS. Air Observer Students, having completed Initial Training School, proceeded to an Air Observer School which together with one month at Bombing & Gunnery School and one month at Navigation School, all successfully completed, would graduate as an Air Observer. At Prince Albert, one hangar and the parachute packing building remain today while a number of commercial buildings have sprung up around the old school. 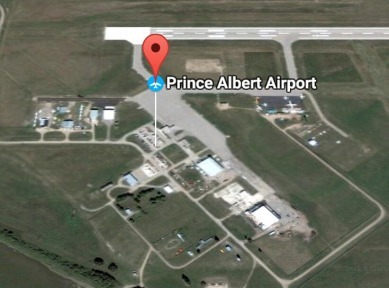 The city of Prince Albert renamed No. 6 EFTS and AOS the Glass Field Airport in honor of Floyd Glass, a local man with a long history as a pilot including time as a pilot instructor during World War II, General Manager of the Saskatchewan Government Airways and creator of Athabaska Airways which still operates in Saskatchewan today as Transwest Air. Mr. Glass died in 2000. There were a total of 17 fatalities at the two school – 13 at the EFTS and four, including a civilian instructor, at the Air Observer School. A large plaque at the airport commemorates the schools and those who died while in wartime training. Jack (John Irwin) Moore was a student of No. 6 Air Observer School. He went on to be a Warrant Officer Navigator/Bomber with a crew in a Hudson aircraft based near Oman on the Arabian Sea. The crew was killed when their aircraft crashed while on convoy duty on July 10 1943. The Commonwealth Air Training Plan Museum holds a wealth of Jack’s artifacts and archival materials donated by his family. 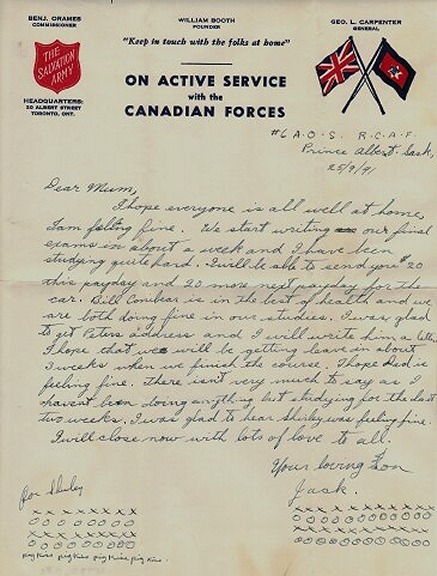 Included in the collection are over 100 letters to and from Jack and his family. 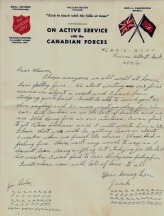 We present four letters sent by Jack to his mother when he was in training at No. 6 AOS. They do not contain any state secrets but give a poignant representation of what might be going through the mind of a young man in training and also, insights in to life for a Air Observer in training. Jack’s father, a veteran of World War I, re-enlisted, in the RCAF and was stationed at No. 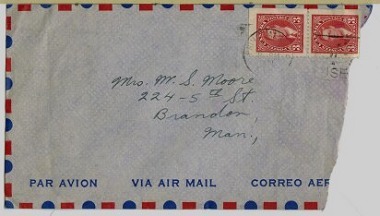 2 Manning Depot in Brandon Manitoba for the duration of World War II. Two of the letters are shown as photographs - all four letters have been transcribed to make it eaiser for viewers to read. I arrived here okay and I sure like the place. The country around here is just like the country around Clear Lake (Manitoba) and it is not as hot up here as it was in Brandon so I don’t think it will be to bad studying. I hope everyone at home is all well. Has Dad heard any more about his Flight Sergeant. The food here is grand , it is a civilian school and we are treated like princes. I hope you will write Lorie soon so I can get some smokes before payday. We are about 7 miles from the town of Prince Albert and we are allowed to go to town once every 3 weeks so I guess that is why we are treated so nicely. This is really a swell course and I think I will like it very much. Bill likes it very much too. I forgot to bring those addresses which Mr. Paine gave me so I wish you would send them. How is Shirely (brother) behaving himself. Have you heard from Len Parker yet? Well I will close now with lots of love to all. I hope everyone at home is all well. I have been studying my head off and this is really a tough course. I have had ten flights since I have been here and I like it very much. Our papers did not arrive at the station for this pay day so they advanced us $10 until they do come. I met Jim Cameron who works here as a mechanic and he wants me to go down to Saskatoon for my 48 hour leave. I would not have time to get to Brandon so I think I will go. I guess Dad is in the Air Force now, I hope he likes it. The country around here is very beautiful it is much like the scenery around Clear Lake. We have a picture show here twice a week which breaks the monotony of study a little, we get 48 hour passes every 3 weeks which is not very much. I will be able to send you some money as soon as my check comes. I will close for now with lots of love to all. P.S. – Best regards to the Moores. I am very sorry I have not replied to your letter sooner but it arrived just when I was into my mid term exam. The work is quite difficult and I have been doing considerable studying. I passed my mid term exams with an average of 79. The highest average was 84. I stood 4th in the class, there were 10 fellows failed and were washed out. I hope that everyone is now in the best of health. I was very sorry to hear Dad had been sick. I bought a real good clarinette for $63.50 and it left me a little short of cash for this payday but I will be able to send you some money towards the end of the month. Had Dad heard anything about his Flight Sergeant yet. How are all the folks in Brandon? The clarinette I bought is a Bettany Cadet, and they gave me a swell case & everything. Ask Mr. Neil if he thinks it is a good one. I am sending you enough money to cover postage and I would like you to send some of my transpositions so that I can practice them. We make about 4 flights a week and each flight is usually about 600 miles so we cover considerable territory. We have not been down to Brandon yet but I think we may get a chance after we finish this course. Where did Dal Harris go to, I have not heard from him for some time. I met one of the fellows that was washed out at Elementary Flying at Portage (Manitoba) who was on the gunner’s class when I was in the senior class. He had 45 hours. He got his discharge and is now making $350 a month flying Ansons. How is Shirley getting along at school? Well I will have to close for now and get back to my studies. Lots of love to all. P.S. – I will not get any leave on this course but we will when we get to Bombing & Gunnery. I hope everyone is all well at home. I am feeling fine. We start writing our final in about a week and I have been studying quite hard. I will be able to send you $20 this payday and 20 more next payday for the car. Bill Conibear is in the best of health and we are both doing fine in our studies. I was glad to get Peter’s address and I will write him a letter. I hope that we will be getting leave in about 3 weeks when we finish the course. I hope Dad is feeling fine. There isn’t very much to say as I haven’t been doing anything but studying for the last two weeks. I was glad to hear Shirley was feeling fine. I will close now with lots of love to all. The Link Trainer was the brainchild of Edwin (Ed) Albert Link, born in Huntington, Indiana in 1904. As a young man, he was employed in his father's organ and piano factory in New York. He dreamed of taking flying lessons but could not afford the cost of fuel, instruction and aircraft time. However, he developed a 'feel for aircraft operations’ by taxiing a friend’s aircraft at nearby airfields in Endicott and Courtland New York. Convinced that he could build a device that would simulate what he had learned while operating his friend's aircraft, Link set to work in 1927 in the basement of his factory to build an aircraft flight simulator. 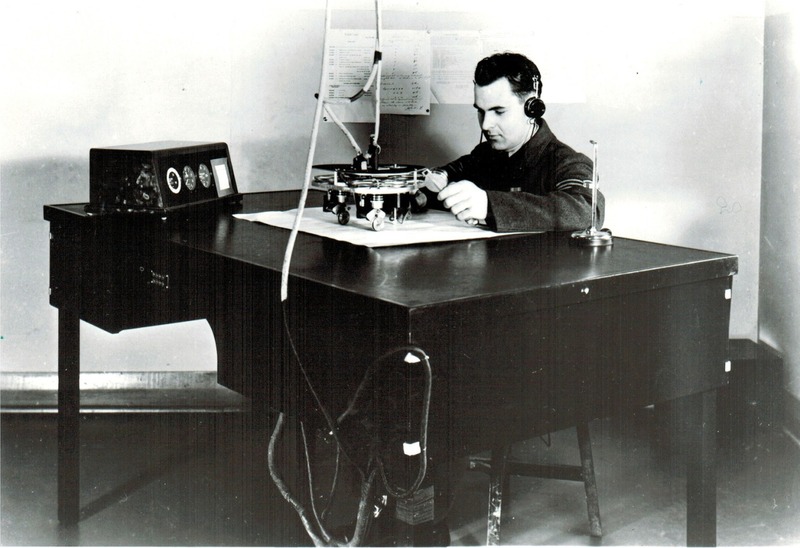 By using technology of the day -- organ bellows and vacuum tubes – he completed the first Link Trainer in 1929. Seeing a commercial opportunity, Link and his brother opened the Link Flying School which guaranteed a customer would learn to fly for $85. Like many businesses at that time. the Great Depression cleaned out the pockets of most of his prospective customers. However, Link and his fledging company did produce 100 units by 1931 of which most could be found operating in amusement parks and parlours throughout America. Tragedy in the early 1930s provided Link's first opportunity to break into the military market. One week into the first United States Army-Air Force contract to carry domestic mail by air by a dozen pilots, all who had been trained to fly by sight only, were killed attempting to fly their aircraft in inclement weather conditions. Army brass, looking for ways to improve the odds for their mail planes and pilots were provided convincing proof of the value of instrument training when Link managed to fly into a New Jersey airport for a meeting with them in weather conditions they considered un-flyable. Based on this unscheduled instrument flying demonstration, the USAAF ordered six of Link's ANT-18 (Army Navy model 18) trainers at a cost of $3500 each. The prospect of world war in the late 1930s and speculation that aircraft would be a primary weapon greatly enhanced the market for Link Aviation Devices Inc. Military planners were quick to realize that his trainer could provide a substantial portion of a training pilot's curriculum while minimizing the risk and costs of flight training in actual aircraft. Thirty-five countries utilized ANT-18 variants of which, over 10,000 units were produced during the Second World War. Production continued with this model into the early 1950s. Faced with a shortage of trainer aircraft in the British Commonwealth Air Training Plan in 1940, Director of Training Air Vice-Marshall Robert Leckie ordered 200 Link Trainers. Link retired from the company in 1954 which was subsequently sold to a number of prominent companies including the Singer Company, Hughes Aircraft and eventually Raytheon. Today, it is a part of the L-3 Communications Company Aviation Division and is producing flight simulators for many of today's modem aircraft including the Canadian Air Force FA 18 and U.S. Air Force F-16. 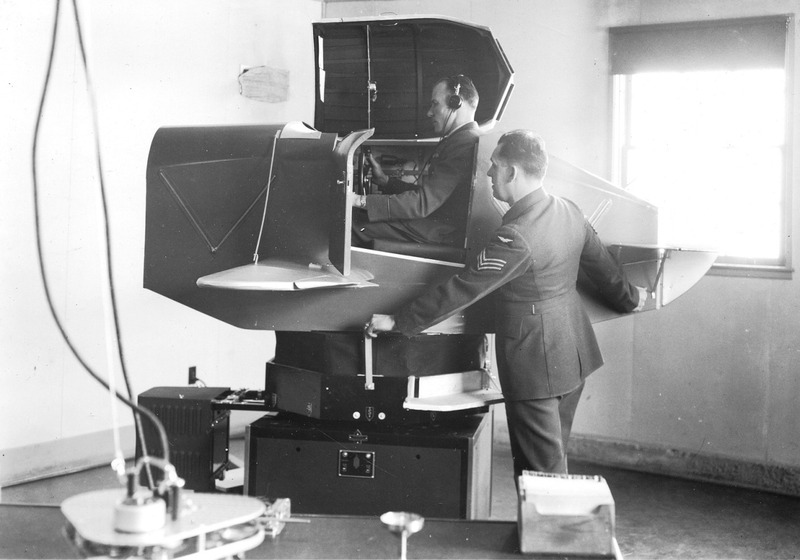 The Link Trainer was an incredible success because of its ability to realistically simulate all types of flying conditions and situations without the costs and risks of leaving the ground. Before the Link Trainer, simulating blind flying conditions (fog, darkness, blizzards) was accomplished by putting the student under a hood in the cockpit of a flying aircraft. It also proved to be a valuable selection tool for aircrew trainees. It was dubbed The `Pilot Eliminator' by some whom failed to show the skills required to pilot an aircraft. Up to the end of the war, Link Trainers came in two major versions - open-cockpit (Visual Flight Rules) and cockpit with hood (Instrument Flight Rules). It is a two It is a two piece system comprised of the trainer cabin and an instructor's station. The cabin, which resembles a toy aircraft with stubby wings, is attached to its base by means of a universal joint which allows movement on three axis in synchronisation with the pilot's flight path. 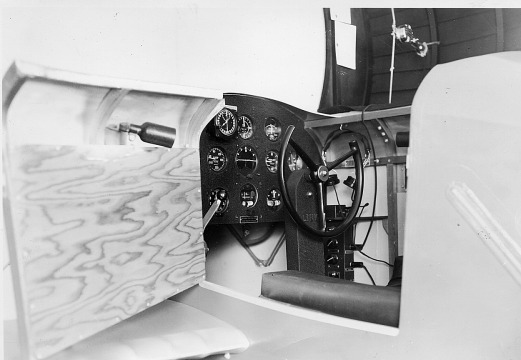 The cabin cockpit contains a single-seat, and a stick or yoke, a full lighted panel of flight instruments and communication to the trainer's station via headphones and microphone. Bellows, supplied with air by a pump in the base, move the cabin in three directions simulating for the trainee all manner of aircraft movements including pitch, roll, dive, climb, spin, pre-stall buffet, overspeed, etc. The air pump also supplies air for some of the instruments while a Telegon Oscillator controls the other instruments and vacuum tubes provide Analog simulator logic to the unit. The trainer's station consists of a large glass-covered map table, a panel duplicating the gauges in the trainer, controls to alter flying conditions for the trainer, communications with the cabin, and a moving marker (plotter crab) which moves across the table plotting the pilot's track. From this station, an instructor can simulate just about any flying condition for the trainee. While training or under evaluation, the pilot trainee would sit in the cockpit responding to directions directly from the instructor or in a pre-planned flight path just like with an actual aircraft. During flight, the trainee was required to respond to all types of situations, like changing wind directions or course deviations, thrown at him by the instructor. One measure of success for the Link Trainer is its nomination as a Historic Mechanical Engineering Landmark by the American Society of Mechanical Engineers which is given to machines and devices showing innovative engineering and providing significant improvements to life. Other nominees honoured with this award include the Saturn V Rocket, Birome Ballpoint Pen Collection, Bay Area Rapid Transit system, Disneyland Monorail system, Evinrude Outboard Motor and Holt Caterpillar Tractor. Ed Link died in 1981. While his Link Trainer washed-out the piloting dreams of many starry-eyed aircrew trainees, it can also be credited with saving the lives of many of its graduates who were allowed to learn solutions to flying problems before they turned deadly in the cockpit of an actual fighter or bomber in the air. The Commonwealth Air Training Plan Museum has an IFR version of the Link Trainer on display in Hangar No. 1 and a couple more in storage which, when space and funds are found for interpretation, may be displayed in a "As it Was" format. The Link Trainer - Part II will be featured in our next Canada 150 vignette. 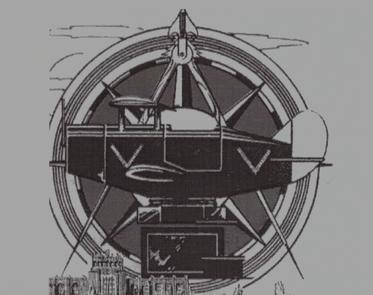 It will have a couple of examples of Link Trainer related Pilot Poetry and a couple of stories gleaned from British Commonwealth Air Training Plan Station Magazines. 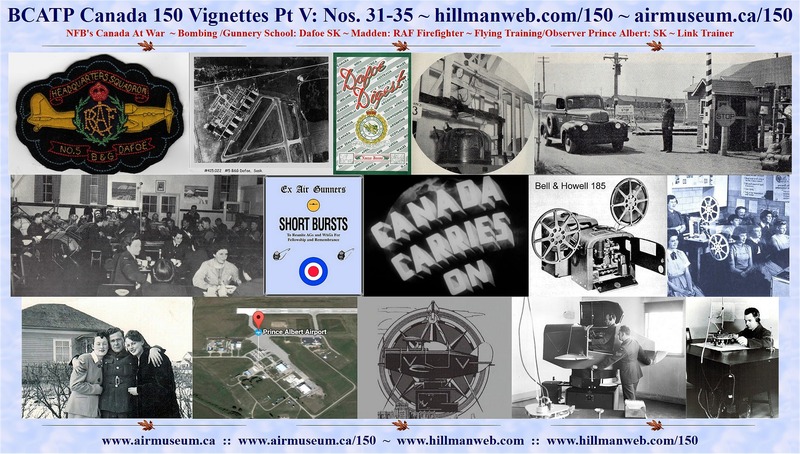 Information Sources for this vignette include The Atlantic Canada Aviation Museum, Wikipedia, L3 Communications, The Allstar Network, Canada National Defence - Air Force 16 Wing, and the National Museum of the USAF.